Bridges Out of Poverty is a nationally recognized and proven program that is changing and revitalizing communities across the country. Locally, the Bridges initiative started gaining momentum in October 2015 when over 200 people attended a training session in Bedford. People were introduced to the Bridges basic concept that every individual needs access to 11 key resources to succeed. Poverty is a key social indicator of health. Poverty impacts every aspect of an individual’s life and drives the individual’s perception of health, self-esteem, employability and chance for self-sufficiency. There is a need to provide those living in poverty the access to health care and other resources to assist families in their journey to overcome poverty and to become self-sufficient. Once a community can provide and sustain that kind of access, people become self-sufficient and healthier, children become more successful in schools, employers can draw from a greater pool of workers and ultimately the economy and the community’s standard of living improve. This level of success requires a strong level of commitment to Bridges concepts from individuals, businesses, local government, churches and non-profit organizations. It all begins with training and exposing everyone to the need for Bridges philosophy as well as the ways to make the Bridges program work. For more information or to schedule training for your group or business, call Denny Huff, Executive Director of the Bedford Community health Foundation, at 540-586-5292. Click here to download our brochure on the Bridges program. The Bedford Community Health Foundation recognizes poverty as one of the major social indicators of health. BCHF will be supporting and sponsoring the Bridges out of Poverty initiative in Bedford County. 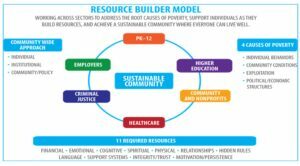 The goal is to work across all sectors of the community to address the root causes of poverty, support individuals as they build resources, and achieve a sustainable community where everyone can live healthy and well. Our goal is to begin to build a comprehensive community approach to reduce poverty. All sectors and economic classes need to be speaking the same language and working toward the goal of a sustainable community. When Bridges concepts are successfully embedded in the community, the results can be life-changing for individuals and communities flourish. As the graphic shows, it will take everyone’s help to transform Bedford into a Bridges community. It requires thought, action, deeds and government policies. But once Bedford is there, the success can be self-perpetuating and the community can become self-sustaining. The resources are key, but Bedford is already widely recognized for taking care of its own. Now those resources must be available to everyone and the efforts to provide them must be coordinated throughout the Town and County of Bedford. You can help make that happen. Click here for more information or to ask how you can help us build a Bridges community.